This popular strain of ïTrue HubbardÍ (named after Elizabeth Hubbard of Marblehead, MA) was introduced in 1898. It always produces one dark green patch on the blossom end of the deep golden skin. Excellent keeper; firm yellow sweet flesh. Hubbard squash produces a large, hard-shelled fruit that can be stored for a long time. Allow squash to remain on vines until fully mature. Gather before frost leaving part of the stem attached to the fruit. Plant seed outdoors in late spring after ground has warmed and all danger of frost is past. Traditionally planted in ñhillsî (a small circular group of 3-5 seeds), seeds can also be planted in rows 6-10 feet apart or in among the corn. Cover seed with 1/2î of fine soil, well pressed down. Germinates in 7-14 days, depending on weather. Bulk Heirloom Squash seed available. 4lbs of Heirloom Squash seed needed per acre. 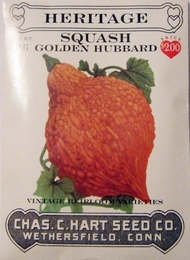 Average Heirloom Hubbard Squash yield per acre - 8 1/2 tons.